Vietnamese food in Central Vietnam is simply the best. Hoian isn’t known for its culinary excellence compared to Da Nang or Hue, but there are a few amazing eateries and food you can try. This happened to be my favorite place because I’ve eaten here twice and each time within a six month period, it has been very consistent. I ate included shredded chicken rice, cao lau (Vietnamese noodles recipe), tiny clams called hen, banh Vac, and banh Dap. Everything is such a speciality and localized to Hoi An. Great Meal! But the only problem with many visitors when they come to Hoian is they don’t know where to eat. So they just adventure into a well- lit place with orange lights and wooden furniture. That is not always the best place. This is very down to earth with young place called. . I really recommend you visiting this place located at 05 Nguyen Hoang, which is that street that sells a bunch of lanterns on the other side of Hoi An across from the Japanese Bridge. Besides eating in restaurants, stunning street food such as the sugar cane juice, the banana roti is one of the most impressive things you should try. Hoi An never fails at satisfying tourists’ taste thanks to a different variety of snacks at a reasonable prices. Banh Mi Phuong is the best of the best I would like to recommend you. 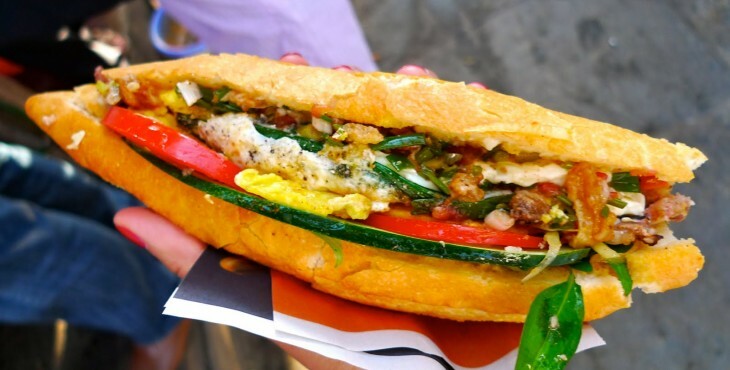 This is a traditional, delicious, sandwich full of the great flavor of Vietnamese food. Although there are a lot of people waiting to buy it every day but you don’t need to stand in the line, just walk around, take a look and order it with waitress. The good news is that vegetarians have a good choice as well and the tofu one was awesome. I’m sure you will fall in love with it immediately in the first time you try. The night market in Hoi An is amount the best I’ve been to and not to be missed when you come. It is located in a beautiful setting. Surrounded by the lanterns, music, restaurants, there is such a nice atmosphere and the street is packed with merchants and tourists! It’s just a short walk from the Old Quarter and I’d say it was a must-see when you’re in Hoi An. people can buy lanterns and go for romantic boat rides or perhaps best of all you can just wander the narrow streets of the old town. 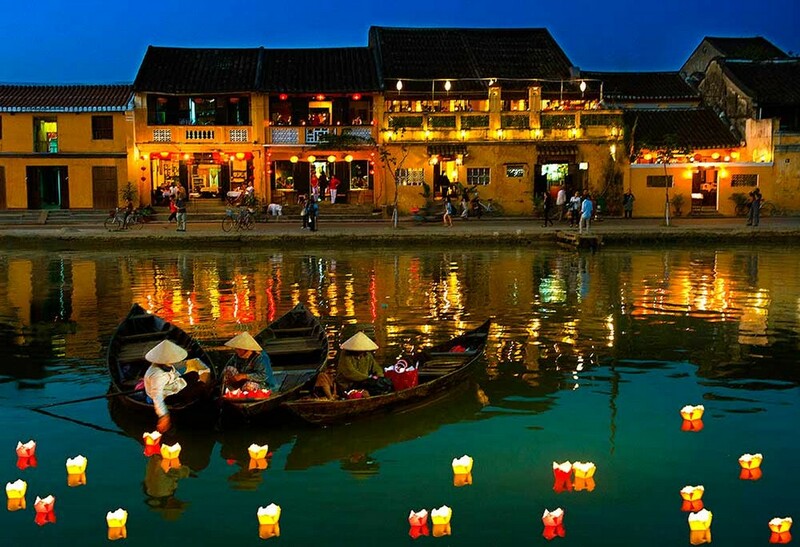 What sets it apart is its beautiful setting of Hoian. Walking around Hoi An in the evening, you will be touched by the awesome, beautiful and often “eccentric” beauty of the bridges here. Thanks to its impressive architecture and special significance, Dragon Bridge Da Nang gradually becomes a symbol of the city. 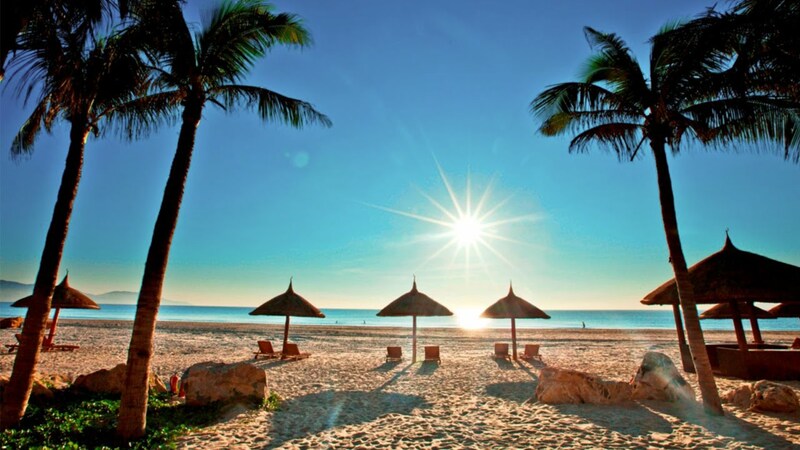 Along with the scenic spots and impressive bridges, it is promisingly one of the most appealing attractions in Da Nang tourism. The bridge owns a unique design simulating the shape of dragon on Han River. The bridge plays an important role in the development strategies and improvement of urban transport infrastructure of the city; simultaneously, it is expected to become a new architectural symbol of Da Nang city. Specifically, in Saturday and Sunday, when the night falls down, Dragon” will spout fire and water using modern technology, making Han River much more realistic and attractive. It is one of the distinctive features of Dragon Bridge that create highlights to attract tourists to Da Nang tours. Offering both cultural activities and great beaches, Hoian is a deservedly popular choice for your vacations especially when the summer is coming soon. Cannot say enough about this place There is so much development going on between Hoian and Danang but thankfully there’s also a lot of beach to cope with all the tourists. You’re gonna be surprised to see a clean and clear stretch of beach of An Bang beach or Cua Dai beach. The lovely waves for body surfing mainly and some under water activities will make you feel satisfied. It will be more amazing of choose where you’d like to have lunch and most of the restaurants will let you use their sun loungers for free. Go through many years with a lot of experiences in providing Hoian tour, Indochina Voyages is one of the most luxurious travel purveyor that makes your holiday unforgettable, beyond the ordinaries and filled with unique experiences. Don’t hesitate contact us if you’re wondering where you should go.